If you receive a diagnosis of alzheimers Disease from the doctor, make sure he or she is giving you the correct information. A friend of ours who we don't see often because he lives on the East coast, and we are in Minnesota, had an alzheimers diagnosis a couple of years ago. He was getting forgetful, and had all the signs of alzheimers . So his doctor put him on the latest and greatest medication. When he and his wife came up for a visit two years ago it was difficult to say goodbye because he was sure this would be his last visit to Minnesota because of his condition. Well, they came up this summer, and he looked better than he did in a long time and said he felt better too. I said, you look great what happened to the Alzheimer's? He said it was a mis-diagnosis. Thank God. It turns out it was a certain pill that he had been prescribed for his heart condition, that was causing the symptoms. Once they figured out what it was, and got him off that drug the alzheimers symptoms went away completely. Unfortunately Many People Do Truly Suffer From Alzheimers disease. I Want To Make You Aware Of Some Things You Could Do To Help Prevent It. Many studies have suggested that chronic inflammation may contribute to alzheimers disease. Moreover, autopsies of people who died with the disease have shown widespread inflammation in the brain. One study found that men with high levels of C-reactive protein, a general marker of inflammation, had a significantly increased risk of alzheimer's diagnosis, and other kinds of dementia. Since many studies have found evidence of brain inflammation in alzheimers disease, some researchers have proposed that drugs that control inflammation, such as NSAIDs, or Statins might prevent the disease or slow its progression. Early studies of these drugs in humans have shown promising results. However these drugs have risks. Talk with your doctor. 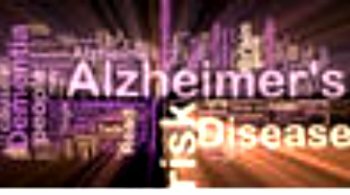 As Researchers Learn More About alzheimers Disease, They Believe That It Is Less A Disease Of The Brain Than Of The Vascular System, Or Blood Vessel System. It is proven that many of the risk factors for Alzheimer's are the same ones for heart disease. . This includes high cholesterol and high blood pressure, and that the build up of protein in the brain is not unlike the gradual accumulation of plaque in the vessels of the heart. When doctors treating Alzheimer's patients took a closer look at who was succumbing to the disease, they uncovered an interesting clue:those who were already taking anti inflammatory drugs for arthritis or heart disease tended to develop alzheimers symptoms later than those who weren't. Preliminary research suggests that low-dose aspirin and omega 3 fish oil capsules both of which are known to reduce inflammation seem to reduce a person's risk of alzheimers disease. The chief omega 3 in the brain is DHA, which is found in the fatty membranes that surround nerve cells, especially at the microscopic junctions where cells connect to one another. DHA is most commonly found in fish oil, which maintains brain fluidity and may help in the maintenance of cognitive function. The fatty acids which are found in fish oil are considered essential fats because the body cannot produce these fatty acids, they must be received through diet, or supplementation. A report in the April 2006 Nature described the first direct evidence for how omega 3 fish oil might have a helpful effect on nerve cells. Working with laboratory cell cultures, the researchers found that omega 3 fish oil stimulates growth of the branches that connect one cell to another. Your Chance Of Suffering From Alzheimer’s Is Cut By 60% If You Regularly Consume Fish Or Omega 3 Fish Oil! This is very significant since right now 1 out of 2 people over 85 in this country have Alzheimer’s! Morris MC, Evans DA, Bienias JL, Tangney CC, Bennett DA, Wilson RS, Aggarwal N, Schneider J. Consumption of fish and n-3 fatty acids and risk of incident Alzheimer disease. Arch Neurol. 2003 Jul;60(7):923-4. What else can you do to reduce your risk of Alzheimer's? One large European study found a 55 percent lower risk of dementia in people over 60 who received drug treatment for hypertension. These people had a reduced risk of both Alzheimer's disease and vascular dementia. Get Regular Exercise. Regular exercise stimulates production of chemicals called growth factors that help neurons survive and adapt to new situations. These gains may help to delay the onset of dementia symptoms. Exercise also may reduce the risk of brain damage from atherosclerosis. Advanced research and clinical evidence suggest that control of inflammation may slow down the aging process and alleviate chronic diseases. The Best Way To Take Control Of Inflammation Is With A High Quality Omega 3 Fish Oil. Unfortunately, most of these preventive measures need to be started well before any signs of alzheimers develop. "What We've Learned With Dementia Is That It's Very Hard To Improve People Who Already Have It," says Dr. Ernst Schaefer, a professor of medicine and nutrition at Tuft's Friedman School of Nutrition in Boston. Improve Your Memory: Scientific Memory Games: Improve your cognitive abilities. Learn what others are doing. Help them with tips about your condition. Get your questions answered too.